The Harley Davidson Road Glide is practically tailor-made for bikers on a budget that are are looking for a cheap Harley touring motorcycle. The Harley Road Glide nudges the $20,000 mark (hard if fully dressed out) but that's pretty affordable for a bike that is in the Harley touring family. You might find a used Road Glide for less but even if you have to pay full retail for a brand new FLTRI Road Glide, from the reviews I've read this motorcycle may be one of the best values rolling today. From jump, the bike’s standard features have been standouts. Extras like quality sound systems and electronic cruise control virtually guaranteed that the road glide was going to be the bell of the ball at its debut. And whoever came up with the names for all of the eight paint colors on the the 2006 model deserves a medal! As a professional paint and body guy, names like Chopper Blue, Deep Cobalt and Brilliant Silver tend to stick in my mind and make a lasting impression. 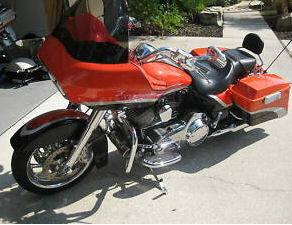 To top things off, the company threw in a frame-mounted fairing and a set of hard, GTX nylon alloy saddlebags (fiberglass bags vanished back in 2004) and that really put the Harley Davidson Road Glide ahead of the pack and on its way to becoming one of the more popular classic American motorcycles created by this iconic manufacturer today! All of the above features creates an active seller friendly market for used Harley Road Glides with far less for sale than there are bikers looking to buy one especially at a deeply discounted sale price from a motivated seller that may have fallen on hard times. Here at GoGoCycles, we hate to see our friends having to sell their prize possessions to raise cash. But if you find yourself in dire straits and wanting to sell for whatever reason, we are here to help you advertise your used motorcycles for sale to the very best of our ability. If you're shopping for a cheap, used Harley we hope that you find what you're looking for and you are welcome to post a WANT ad for parts or accessories if you don't find an ad for what you need. If we can help you in any way, please drop us a line and tell us how we can be of assistance and thanks for checking us out here at GoGoCycles!